Four years ago, a methodical search for a new place of worship led a group of gay Roman Catholics to the Rev. John Unni, the youthful priest at St. Cecilia’s Church. The search committee was blunt: Would the priest accept an influx of gay and lesbian parishioners? “He told us, ‘All are welcome,’ ’’ said John Kelly, now head of the St. Cecilia Rainbow Ministry. Kelly and other parishioners credit Unni with managing the merger of the predominantly gay congregation from the Jesuit Urban Center, which closed in 2007, and with keeping gays and lesbians in the Catholic Church, despite the uneasy balance between the church’s message of love for all and its strict doctrine against gay relations. Father John, as his parishioners call him, says he is trying to live the words of Jesus Christ, as he has seen them lived out. 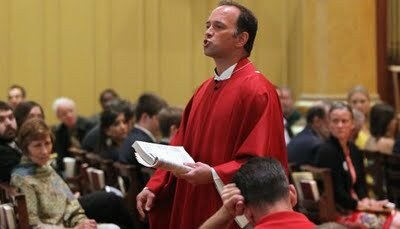 He said the response from his hometown was “the total opposite to the hateful reaction’’ that Unni and St. Cecilia have received recently from some conservative critics over the church’s plan to hold a June 19 Mass under the theme, “All are Welcome,’’ to commemorate Boston’s Gay Pride Month. “All we’re trying to do is welcome a group that has been marginalized,’’ he said. Last week, the archdiocese stepped in and postponed the “All are Welcome’’ service, saying it gave the impression that St. Cecilia’s supported the annual Gay Pride celebration. Unni addressed the controversy during his homily Sunday, saying parishioners “are welcome here, gay or straight, rich or poor, young or old, black or white. Here, you all can say, `I can worship the God who made me as I am.’ ’’ Parishioners responded with a standing ovation. Parishioners say Unni is a low-key, approachable guy who enjoys yanking weeds around the church property in Back Bay. Yet on Sunday, they say, he transforms into an electrifying speaker who paces the aisles during his homilies and who has a knack for making the teachings of the Bible relevant to modern life. “He’s very good at explaining Catholic social justice teachings, which include inclusiveness,’’ said Mark Lippolt, a member of the parish council. Unni’s father was a barber; his mother a hairdresser. He is a former English teacher at the old Christopher Columbus Catholic School in the North End, from 1983-85. He remembers making $150 a week as a teacher and being inspired to start his own landscaping business. But the priesthood kept gnawing at him. The call to join the clergy “was not a thunderbolt, but a real presence inside me that grew as time went on,’’ Unni said. He entered the seminary in 1986 and later worked at parishes in Dorchester and Danvers before moving to St. Ann’s Church, near the campus of Northeastern University. He came to St. Cecilia about seven years ago, when St. Ann’s closed. Mark Arsenault can be reached at marsenault@globe.com. This story has a lot of resonance for me because the company for which I design scenery and lights, and on whose Board of Directors I serve, produced Benjamin Britten's church parable Curlew River at the Jesuit Urban Center in Boston's South End neighborhood not long before the Boston Archdiocese forced it to close. When I walked into the big neo-classic style church to begin the put-in of the set and lighting, I was struck not only by the warmth of the welcome (the Pastor visited me several times during my work day to say how happy he was to have us and Britten's opera in the Center and to urge me to make any of the company's needs known without hesitation) but also by the row of pictures of parishioners lost to AIDS that were enshrined on a projecting molding just behind the altar. Many had small piles of memorial notes next to them; all were visible from the nave of the church. I had not known of the Center's orientation before I entered the building that day and had wondered how a largely if not predominantly gay company producing the work of a gay composer would be received; I quickly found out and my question then became, how long would it be before Sean Cardinal O'Malley turned the screws on it? Turns out that pressure was already being applied, and the closure came within a year of our performances. Now I know the end of the story, where that wonderful congregation went and whose arms opened to welcome it. The next question is, how long before the axe falls on Father Unni -- or has the social conscience of rank and file Catholic parishioners progressed so far beyond that of the hierarchy that some kind of accommodation will have to be made? Well, that's reassuring news. It only takes one good and charismatic man (or woman) and so much bad can be reversed. I had a Jesuit education. Today's Church is so different than the Social Justice focused Jesuit Church of the early 1970s. I would suspect the ax falls soon. wish i could find a catholic parish like that in the manchester area.